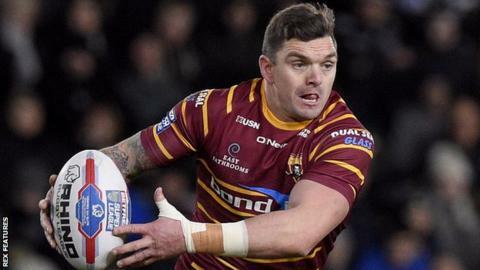 Huddersfield's veteran playmaker Danny Brough has been banned for three matches and fined £500 for verbally abusing a touch-judge. The 35-year-old was sent off towards the end of the Giants' 30-12 Super League defeat by Salford on Sunday. Brough pleaded guilty to a Grade D offence of disputing. He will miss the trip to Super League leaders St Helens on Friday and Warrington the following week, as well as the home game with Widnes on 4 May.